Title: 'Magna Britanniae complectens Angliae, Scotiae et Hiberniae Regna in fuas Provincias et Comitatus'. Rare Queen Anne edition. 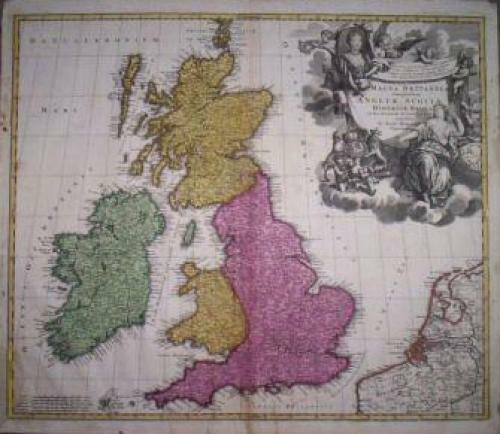 A large map of the British Isles by Johannes Baptiste Homann, one of Europes premier mapmakers of the 18th century. The map has a spectacular large format cartouche that includes a coat of arms and portait of Queen Anne, an allegorical representation of Britain, the unicorn and lion and other figures. Johann Baptist Homann (1663-1724), his son, Christoph (1703-30), and heirs are acknowledged to be the most important German map publishing firm of the 18th century. The firm was founded in Nurnberg about 1702. Upon Johann's death, the firm was continued by his son, Christoph until 1730 when the firm passed to the heirs on the condition that they publish under the name "Homann Heirs". The condition is average with bright colours on good paper. There is a small repair to the bottom centrefold (outside of the image) and in the bottom left there is a 4 cm facsimile repair of the border.